The study has thus far exposed the PYD’s Neo-Ottoman sympathies, militant left-wing extremism, abhorrent hate for the Assad Presidencies, and other unsavory yet self-declared details that the international media typically doesn’t include in its reporting on the group. Given that the Kurds have just unilaterally proclaimed the “Federation Of Northern Syria” and that their “Project of a Democratic Syria” manifesto is their official guiding document for actualizing this, it’s relevant to the bigger picture to speak on the specific type of system that they want to impose on the rest of Syria. The format for this final section will resemble that of the previous one in which the Kurds’ own pertinent statements are recycled in their original beginning-to-end order in describing the most functional details of their vision. The author will then consequently summarize all of this and tie it in with some of the earlier-exposed plots that were revealed in Part I. The general idea is that the Kurds are pursuing the Yinon Plan in seeking to divide the formerly unified Arab lands east of “Israel” into an eclectic hodgepodge of easy-to-influence identity-based statelets. Structurally speaking, this is the most extreme expression of Identity Federalism (which the author analyzed for Russia’s National Institute for Research of Global Security), akin somewhat to a semi-anarchic system of local city-states and ethno-regional statelets in which “federalization” mixes with selective autonomy to impose a checkerboard of competitively feuding entities all throughout an internally partitioned Syria. The US and its unipolar allies are clearly poised to make serious geostrategic gains in the region via the imposition of this administrative-political scheme onto Syria, and if the Kurds get what they want and succeed in actualizing this divide-and-rule vision, then it would irreversibly set into motion the eventual de-jure dissolution of the Syrian state. “Considering the huge number of complex problems that it faces, Syria requires a radical solution that addresses not only the symptoms but also the causes, lest reaction reemerge. “Furthermore, in Syria’s democratic solution, the individual becomes a citizen within the framework of constitutional citizenship, while also being a free individual in his democratic society. So too the constituent peoples retain their democratic social identity in the framework of constitutional citizenship. “The units of the Democratic Self-Administration can maintain diplomatic relations with other units provided they respect the laws and the constitution of the center. The Kurds’ “federalization” proposal engages in a lot of contradictory doublespeak about the “combination of centralization and decentralization”, but in essence the PYD is only dressing up its naked plan to strip the state of all of its power and usher in the creation of a weak symbolic entity that’s at the mercy of its constituent “federal” units. The “national” government will only serve as a communication platform through which the “semi-democratic independent” entities can ‘neutrally’ interact with one another, although such a purpose might be rendered useless if the “units of Democratic Self-Administration” simply enter into bilateral relations with one another instead or choose to not have relations with their counterparts. According to the “Project of a Democratic Syria”, the country is to be “divided administratively” based on “scientific criteria” into identity-based “units of Democratic-Self-Administration” that have the constitutional right to “self-determination” (e.g. to declare independence). Each of these prospective subnational governments “can and should form its own forces” and will have the vague right to “maintain diplomatic relations with other units” (whether subnational ones within Syria or separate independent states is unclear). Additionally, these constituent states will offer “constitutional citizenship” and “dual citizenship” to their inhabitants, as well as make “all authentic languages as official languages” in their given warlord zones of control. On the economic-legal front, all entities will have their own “semi-independent economy” and the criminal code will be based on relative “social morality more than on law” and thus will predictably vary from subnational territory to territory. While refraining from the de-jure partition of Syria, the Kurds’ plan unmistakably sets into law the de-facto internal partitioning of the state based on subjectively defined “scientific criteria” that simply amounts to slicing the country up based on its “constituent” identity parts. This is no different than what Sykes-Picot did to the former Ottoman Empire except that the current iteration is being practiced on a geographically smaller scale, albeit one of comparatively similar strategic importance in the contemporary global environment. Sykes-Picot 2.0 is a major problem because the document repeatedly emphasizes the “genuinely native” status of Chechens and Turks, meaning that these two realistically non-native demographics will assuredly receive some sort of “federalization” or sub-federal autonomous political-territorial unit of control, complete with its own military forces (i.e. ‘constitutionally legitimized’ ethnic-affiliated terrorist groups). The Alawites might not even be afforded this luxurious privilege since they’re only described by the Kurds as “constituent group” but not as a “genuinely native” one. If this plan enters into action, then the Alawites would likely have to share whatever historical territory they might otherwise claim as their own with the nondescript “Arabs”, the closest of the Kurdish-approved “genuinely native” groups in Syria. The objective of this internally partitioned framework is plainly to pit as many of the identity-subdivided Syrians and their Chechen-Turkish jihadist colonizers against one another as possible. Returning to a major point that’s been repeated several times so far, the Kurds are very clear about their demand that “each province or administrative region can and should form its own (military and security) forces.” It’s not clear from this context whether that right is bestowed only on actual “federalized” entities or if it’s extended to the sub-federal autonomous units within them as well, but given the chaotic Identity Federalization vision inherent in the document, it can be easily assumed that this is affirmatively the case. Syria would therefore devolve into a patchwork of fratricidal-inclined “federal” and autonomous statelets that could easily be provoked into a divide-and-rule Hobbesian conflict. Although not directly stated in the document itself, it can be strongly inferred that the Syrian Arab Army (SAA) would cease to exist if the Kurds got their way because it’s specifically written that “The system (of separate “federal”-autonomous military forces) will defend the nation as a whole.” Considering this and all the other statements made about the need for a “decentralized” state and the consistently derogatory manner in which Assad-governed Syria was nastily described in Part II, it’s reasonable to conclude that the PYD has dedicated itself to dismantling and destroying the SAA throughout the prolonged course of any prospective negotiation process that it’s allowed to participate in. 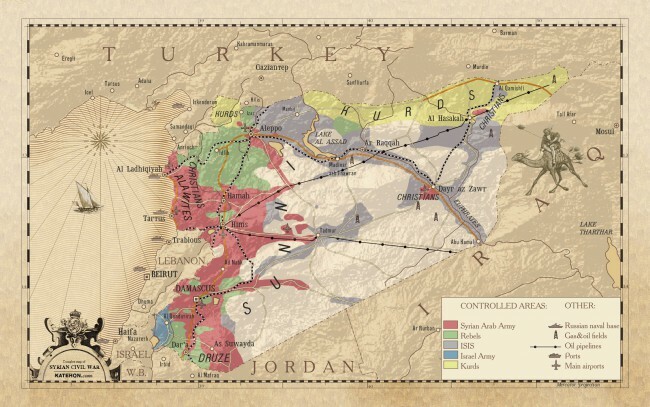 While not expressly stated in the primary document itself, it’s very possible that the Kurds and their unipolar patrons plan that each ‘Balkanized’ entity within Syria will have the right to conduct its own form of international relations outside the purview of the central Damascus government (if Damascus even in fact remains the capital under such a “federalized” arrangement). There’s a lot of leeway in interpretation over what the “diplomatic relations” clause of the document entails, so it’s conceivable that the Syrian Kurds might expect that their forthcoming “federal” entity will take the prerogative in bestowing itself with the same broad ‘rights’ as its Iraqi Kurdish counterpart, whether or not this actually conflicts with the constitution (like it does in the Iraqi case but is still recalcitrantly practiced by Erbil). If this turns out to be the case, then each “federal” and possibly even sub-federal autonomous (Chechen, Turkish, etc.) unit could conduct subnational-to-state relations and behave as its own de-facto independent country. One of the most disturbing platforms that the Kurds are advocating in their “Project of a Democratic Syria” blueprint is the liberal bestowing of “constitutional citizenship” to every “constituent people”, meaning of course that Turkish and Chechen jihadists will also be eligible to receive a Syrian passport and a legal designation within the post-conflict “federation”. Furthermore, the concept of “dual citizenship” contextually means that each Syrian citizen will have both national/”constitutional” citizenship and a specific “citizenship” that accords to their given political-administrative locale, for example, a “Kurdish” or “Turkish” one for these respective fiefdoms. Passing out double passports to each and every individual that is physically inside of Syria after the “federalization” (internal partition) is extremely destabilizing on the international level and has the very real risk of legitimizing foreign stateless terrorists as “Syrian citizens” under their assumed nom de guerre. Everything that’s been described up until this point plays to the supreme interests of Erdogan’s Neo-Ottoman obsession, and it’s all but guaranteed that he will exploit these made-to-be-abused “federal” stipulations in order to flex his geopolitical muscle. As a simple example, if the Kurds’ plans come to fruition, then the Turks will enjoy some sort of “federal”-autonomous status of “Democratic Self-Administration” and “self-determination”, complete with “constitutional” and “dual” “citizenship” and the passports to go with it. It’s not difficult to imagine that Erdogan would order hundreds of thousands of Turks, even those under the guise of being ‘economic migrants’, to flood into the prospective “Turkish” zone in Syria in order to functionally colonize it in accordance with the ‘new constitution’. This ethno-regional unit would have the privilege of engaging in “diplomatic relations” with Turkey proper, and if any conflict breaks out between it and its Syrian-based “federal” counterparts, then it could immediately evoke its right to “self-determination” by proclaiming ‘independence’ and requesting a conventional Turkish military intervention to support it. In parallel, a scenario very similar to the above can occur in regards to the “genuinely native” Chechens that would also be afforded their own “federal”-autonomous “Democratic Self-Administration” replete with the same rights that the Turks and all others would have. In this case, however, their territory would function as a safe haven for jihadist-minded Chechens to flee to in training for forthcoming attacks against the Russian Federation. Ironically, one of the partial reasons why Russia intervened in Syria at Damascus’ request was to kill its terrorist citizens before they returned home to carry out future attacks, but if anti-government Chechens easily gain the right to travel to their ‘new homeland’ in Syria (complete with a “Syrian-Chechen” passport to do so) and militantly train there without breaking any laws or attracting undue international attention, then the structural threat would remain the same if not worse and the most pressing domestic goal that Moscow wanted to achieve in fighting terrorism in Syria would be revealed as having been an embarrassing failure. Even worse, the new reality of an internationally ‘legitimized’ Chechen separatist-terrorist safe haven in Syria might even make Russia’s security situation more dire, and if this entity was positioned within the de-facto independent Turkish “federal” unit described above, then Moscow might find it difficult to militarily respond to it without setting off a predictable chain reaction of escalation that might lead to a direct confrontation with Ankara. The final point to be made in the study when describing the Kurds’ “federalization” (internal partition) aims is that they have explicitly threatened to realize them via “reform or revolution”. To put it another way, if “negotiations” don’t’ succeed in giving them what they want, then they might work with likeminded domestic elements to trigger a series of Color Revolutions inside the primary cities of what they conceive will be each of Syria’s “scientifically” “divided” “federal”-autonomous statelets. Even more menacingly, however, when they threaten that “will be at the forefront” of this “revolutionary” movement, the PYD might even be intimating that they would march the way to Damascus, picking up momentum by integrating each and every hodgepodge “rebel”/terrorist group into a haphazard but militarily effective fighting front along the way. There’s no way to tell exactly what the Kurds meant when they issued this purposely vague threat in their “Project of a Democratic Syria” manifesto, but given the rest of their hate-filled intentions contained within that document, the aforementioned scenario forecast likely isn’t that far from what they plan to do if they don’t succeed in imposing their “federalization” demands via their ‘Plan A’ of “negotiations” and “diplomacy”. How can Syria deflect the US-UK “Federation” Spin?